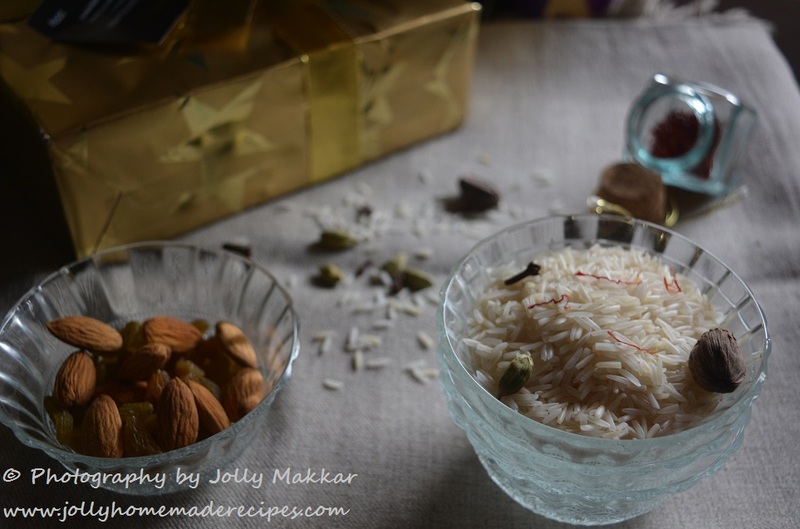 Hello to all my readers and followers, sorry for posting after a long time, as I am busy with my little one which is coming into my life this march, so no time for posting but today I got some time so thought of sharing sweet rice recipe for the occasion of raksha bandhan. Raksha Bandhan is an auspicious occasion that celebrates the special bond of love and caring between a brother and a sister. On Raksha Bandhan, the sister ties the rakhi on her brother wrist hand and praying for his good wealth, success and happiness. And in return brother gives a gift o her sisters and also promise to protect her always !! Happy Raksha Bandhan to all sisters & her brothers !! You can try all different kinds of nuts and dry fruits to your liking as they will all go well with this Sweet Rice. It is a traditional Punjabi dessert prepared during festivals like Basant Panchami, Raksha bandhan, Diwali, etc., and also served on auspicious occasions like marriages. 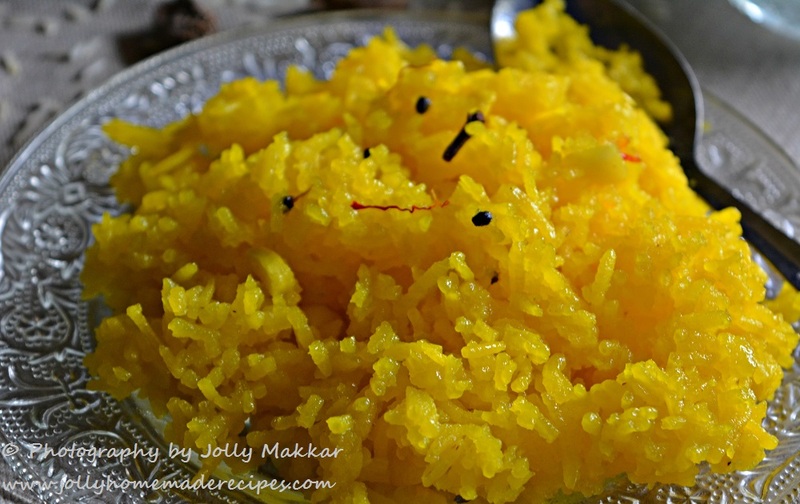 This yellowish colored rice recipe is a sweet and delectable one. They are very popular in Punjab. This is one of the desert which is liked by every person and loved by kids also. This is also called "Zarda" and traditional Pakistani sweet dish, which is made in every occasion. Rice based sweet dishes are very popular from ancient times, as rice was staple grain, available in most households. Saffron also known as kesar in hindi and kesar has some healthy benefits also it contains many minerals such as cooper, potassium, calcium, manganese, iron, magnesium, zinc and selenium. Some of these are helpful in controlling blood pressure as well as in the formation of hemoglobin. The benefits and medicinal properties of this highly priced spice, make it a valuable culinary ingredient worldwide. There are a lots of traditional delicacies that are relished on this Festival and making the occasion even more enjoyable. 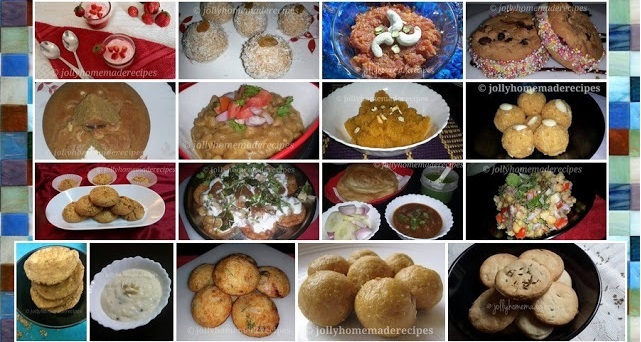 Here are some selected recipes to help you celebrate the festival. 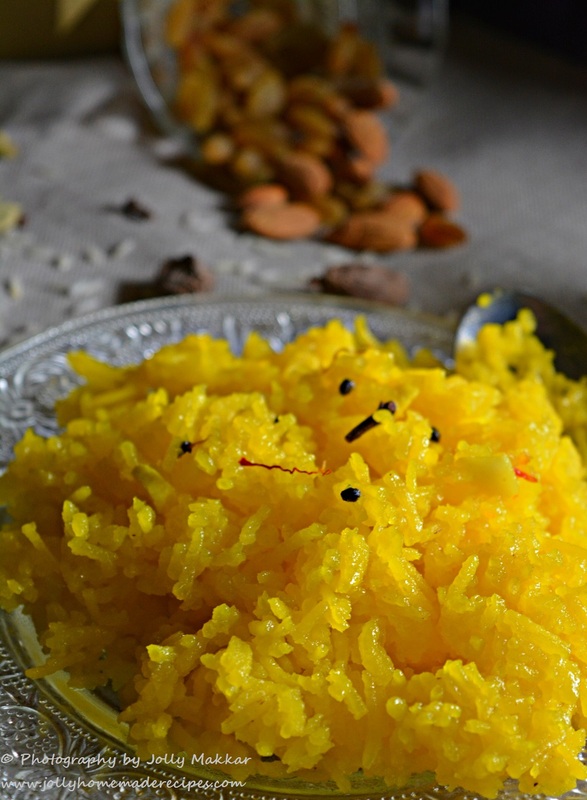 Follow an easy recipe of meethe chaawal and treat your family this time with an exotic saffron flavored rice that has years of legends attached to it. 1. For Sugar Syrup - Mix 1-1/2 cup water and sugar in a pan. Add saffron with food color and bring to boil, stirring in between. Keep it aside. 2. Heat Desi ghee in a heavy bottom pan or kadai. Add green cardamom, black cardamom seeds and cloves. Stir for few seconds. 3. Add drained rice and mix gently. Add 2 and 1/2 cup of water and boil it. 4. Reduce flame. Keep tawa under the pan of rice as soon as it starts to boil to reduce the heat further. Cook it till the water gets absorbed. 5. Now add sugar syrup. Mix lightly sugar syrup with rice and add chopped almonds, drained out raisins (any dry fruits which you like). . Cover the lid and cook on low heat till rice is done and saffron sugar syrup is absorbed. 6. Garnish with nuts and Serve hot Meethe chaawal to your family members. What a pleasant colour.. So inviting and delicious rice. I am not a great fan of sweets but I should try this for my husband who loves sweet in all his food. Thanks for sharing ! 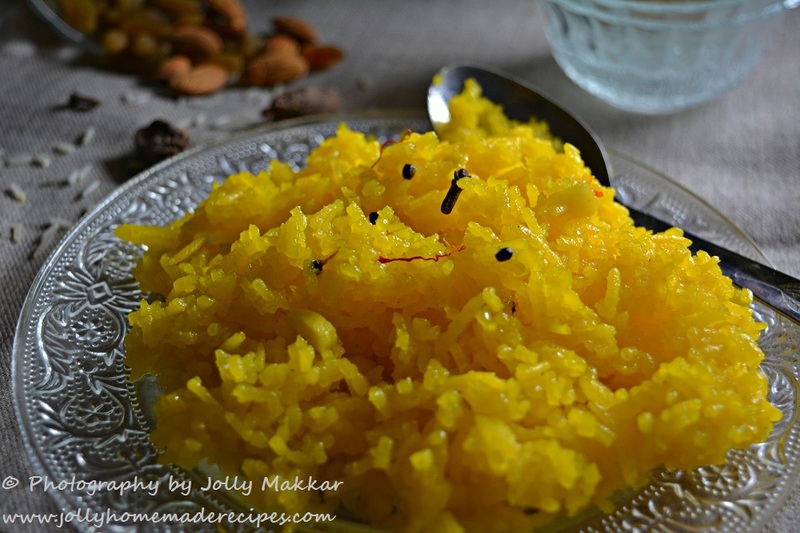 Meethe chawal is my moms favourite, and your recipe sounds so good loved the appealing yellow colour its so tempting. Perfectly made sweet rice. Love the texture of rice there -- individual grains and the dish sounds so aromatic and fragrant with the addition of all the spices. Yumm!! We make this one too on all festive occasions and it is called Tehri in Sindhi. Whao can resist a well-made Meethe Chawal? Not me for sure! I love eating this with spicy mango pickle. Simply cant take my eyes from that delicious meethe chawal, my mouth is just watering here. Who can resist to this beautiful dish. Beautiful colour of the sweet rice and full of fragrant spices.I've tasted sweet rice but have yet to try making at home. Belated birthday wishes to you Jolly, hope you had a great day. 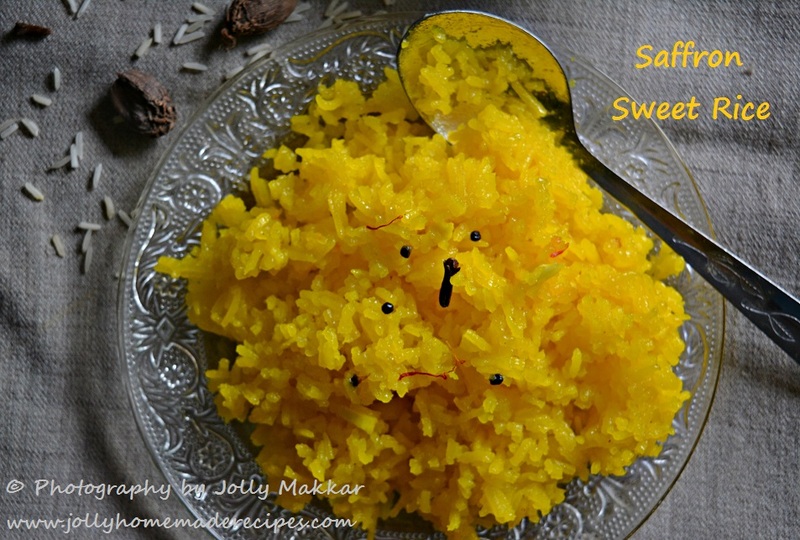 I love sweet tice and I am sure this dish will have been so fragrant with the saffron and spices. A very royal dish indeed. 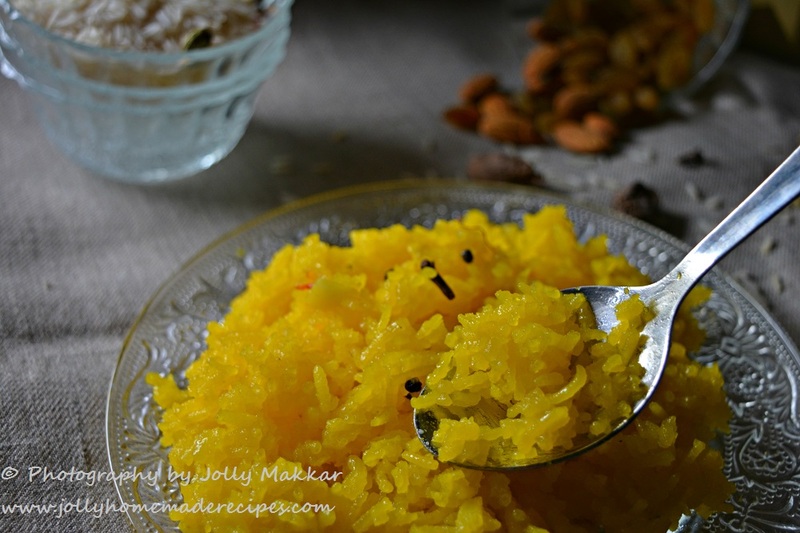 I love sweet rice and the flavours with the saffron and spices and the nuts must have made the dish taste royal . Such a sunny, happy, bold and beautiful dessert! Truly Punjabi in essence. 😊 My husband and I can skip the main course to enjoy a bigger helping of meethay chawal. I love all the aromatics and nuts you have added to make it more rich and royal. Love the yellow color of these beautiful rice and I know how flavorful they must be. Beautiful pictures. Sweet rice looks divine. Love the color and ingredients. I will try this for upcoming festivals. Love that colour and its apt for festivals. Flavourful, aroma of ghee and cardamom really sets your tastes buds wanting more. Beautiful share! Its one of my fav prashad. 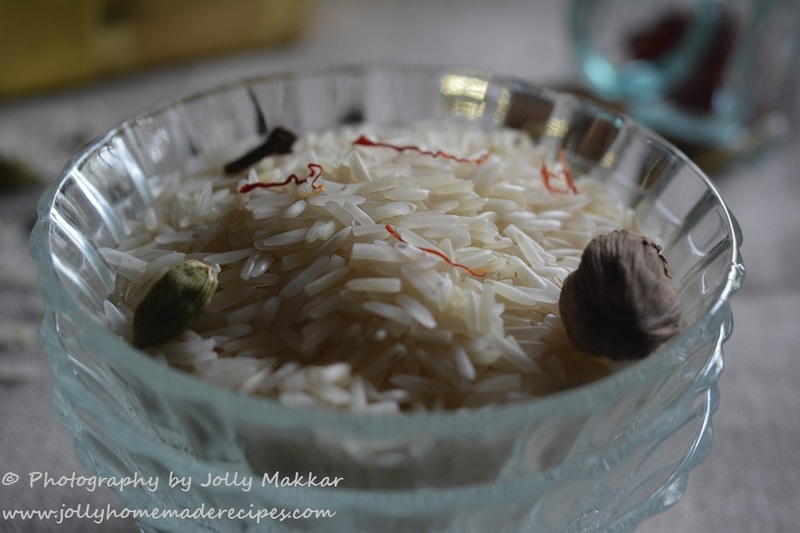 Meetha chawal, I often prepare this at home. Yours looks delish Jolly. Meethe chawal is a hit at my place. I always fall in love with the appealing yellow colour.